Remember the childhood story of the Three Bears? 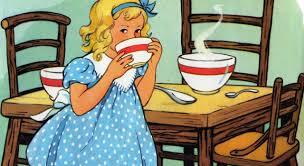 Goldilocks was in search of the Just-right bowl of porridge, the just-right chair, the just-right bed. She tested each bowl, each chair, each bed, until she found the one that for her was Just Right. Goldilocks was persistent. She kept on trying until she found something that for her was just right. She didn’t give up, even in the face of repeated disappointment. Something in her experience kept on telling her to keep looking. When she found what was just right for her, she knew. However, Goldilocks was also selfish. She walked into someone else’s home without knocking. She helped herself to food without being invited. She broke furniture by sitting on a chair that SHE thought was just right, but which clearly was too small for her, and in the end she was scared to pieces when the bears came home and found her asleep in Baby Bear’s bed. Goldilock’s ability to recognize what she wanted and to be willing to keep looking for it is admirable. However, sometimes that intense focus becomes a problem in relationships. I often see couples searching for those Goldilocks moments without awareness of the price that they may pay in looking for them. Finding a Just Right moment without paying attention to the process of getting there can easily backfire. Goldilocks knew what she wanted and went after it, but in the process she lost sight of the perspective of others. Couples do this all too often by focusing on what one or the other wants without awareness of the wants of the other person. I am so often surprised and saddened by the struggle that even the most articulate individuals have to use words in their relationships. Partners expect each other to know their wants and needs without ever having articulated them. Partners tell themselves: “If I have to tell you about it, it isn’t valid.” The result is that you don’t get what you want, you are guilty of the expectation of mind-reading, and you are often disappointed, because contrary to popular opinion, human beings in relationships have not mastered the “skill” of mind-reading. Are you like Goldilocks in your coupleship – so determined to find what you want that you forget to check in with your partner? Your story might have a different ending if you remember to ask your partner about what he/she wants, and if you create that story together. Just Right moments in a coupleship are best created by partners who are willing to speak up, use words, and be direct about they want and need.